Some of our most popular dog breeds have a delightfully appealing and solemn appearance. These characteristics often include long ears, a longish face with quite a lot of loose skin on it, and frequently with the addition of drooping lower eyelids. The sad or woeful expression that often accompanies the droopy eye dog triggers an emotional response in human beings. Because drooping eyelids are appealing to puppy buyers, breeders are tempted to select dogs who display this characteristic in ever more extreme forms. And as a result, some dogs are becoming more droopy eyed than before, and droopy eye dogs are appearing in breeds where they didn’t exist before. This is a problem for dogs, because eyelids play an important part in the health of your dog’s eyes. And nature designed them exactly as you see them in wild dogs and wolves for a very good reason. Tight eyes, or eyelids that fit snuggly against the dog’s face are extremely important in protecting the eyes from dirt and debris, and in keeping the soft tissue below the eye free from infection. What is ectropion in dogs? Ectropion is the medical name for the drooping of the lower eyelid so that the eyelid rolls outward and falls away fro the eye itself and exposes the mucous membrane or conjuntiva, to the environment. [wp_ad_camp_2]The conjunctiva is the portion of tissue that lines the inner eyelids and should never be exposed to the elements. Humans get ectropion too, but not on purpose. It is often a consequence of advancing age. And people with ectropion are vulnerable to infections and repeated bouts of sore, inflamed eyes. Ectropion usually affects both eyes but can sometimes occur in just one eye. Any breed of dog could suffer from ectropion, but it is far more common in certain pedigree breeds. Namely those who have loose skin around their faces. 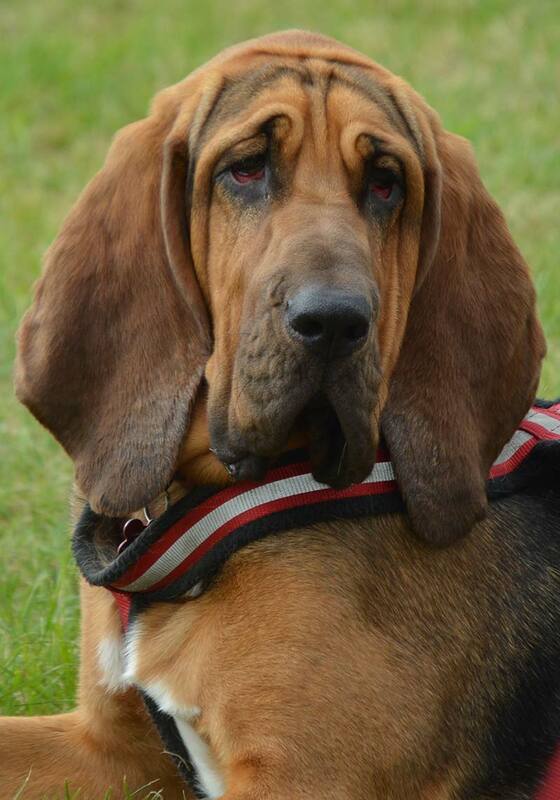 Bloodhounds are probably the example which springs immediately to mind when you think of drooping faces, but it also causes problems for other breeds. You are most likely to see ectropion in sporting and hunting dogs that have been bred for the show ring. Several breeds of spaniel and hound are affected. For example, the Cocker Spaniel (English), the Clumber Spaniel, the Bassett Hound, and even some of our retrievers. 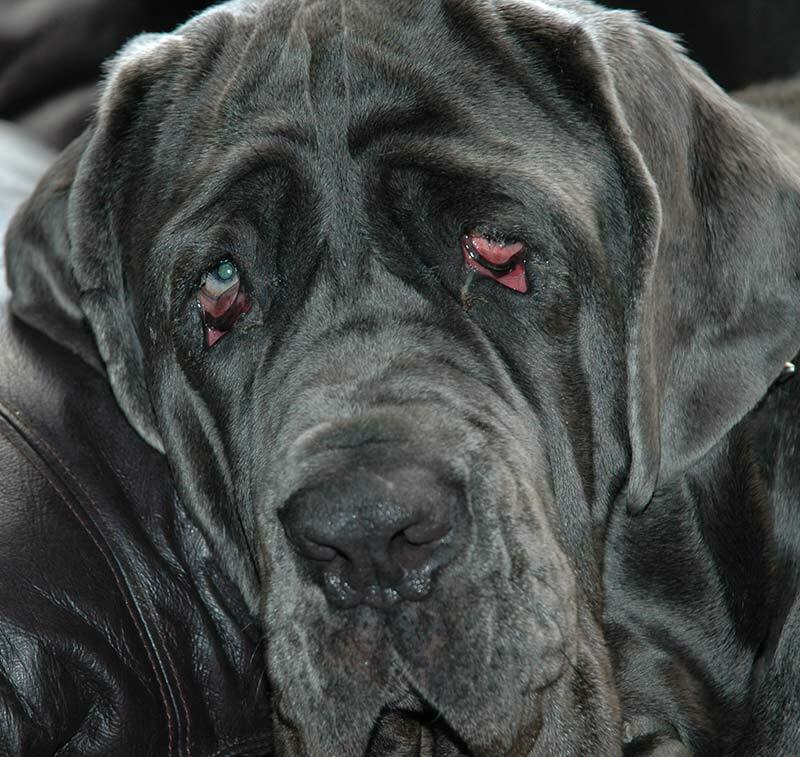 And you will also be able find a droopy eye dog in many of our giant breeds – Mastiffs like the Neopolitan Mastiff, Newfoundlands and Great Danes for example. 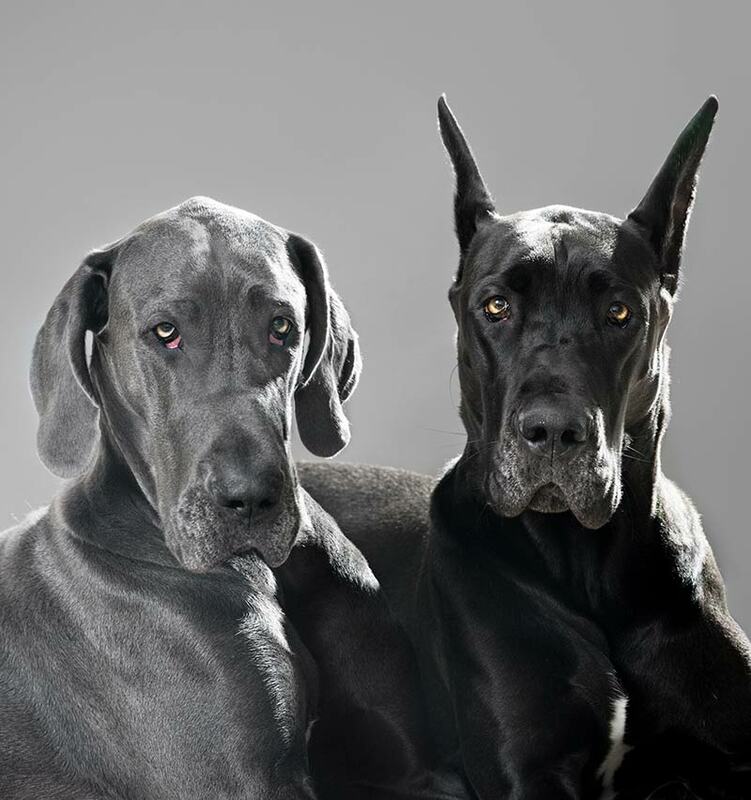 This photo of two Great Danes was taken to illustrate the difference between natural and cropped ears. But it also illustrates the difference in eyes between two individuals of the same breed. The dog on the left has quite significantly more droopy eyes. On the whole, ectropion is much rarer in dogs bred from working lines. This is because a working dog needs tight eyes to protect himself when hunting outdoors. The droopy eye dog tends to be far more common in dogs bred for the show ring. Does my dog have ectropion? If your puppy has ectropion he will probably start to show signs of this at less than a year old. However, ectropion can occur later in life as a result of the facial tissues losing tension in loose skinned breeds. Ectropion is not always immediately obvious, and does not always affect a dog all of the time. For example, being tired out after exercise can cause ectropion to occur temporarily. It can also occur as a result of hypothyroidism, weight loss, muscle loss or scaring to the eyelid after injury. Symptoms in the eye itself include protruding lower eyelids, a lack of contact between the lower lid and eye ball, and exposure of the conjunctiva. There will also be other signs on your dog’s face, such as staining from poor tear drainage and a history of discharge from the eye. Ectropion sufferers will experience a lot of issues with foreign objects irritating their eyes and get frequent bouts of bacterial conjunctivitis. If you suspect your dog is suffering from any of the symptoms above, then your vet will be able to diagnose him through examination. In his opthalmic evaluation your veterinarian will be looking for evidence of bacteria, ulcerations, abrasions or foreign objects. As well as the easily visible symptoms shown above. Shockingly , the most significant cause of ectropion is human beings. Or to be more specific dog breeders and puppy buyers. 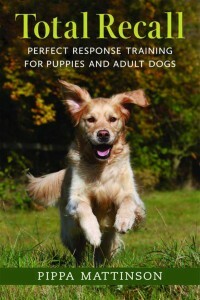 [wp_ad_camp_1]That’s because the condition is usually genetic – passed on from parent dogs to their puppies. 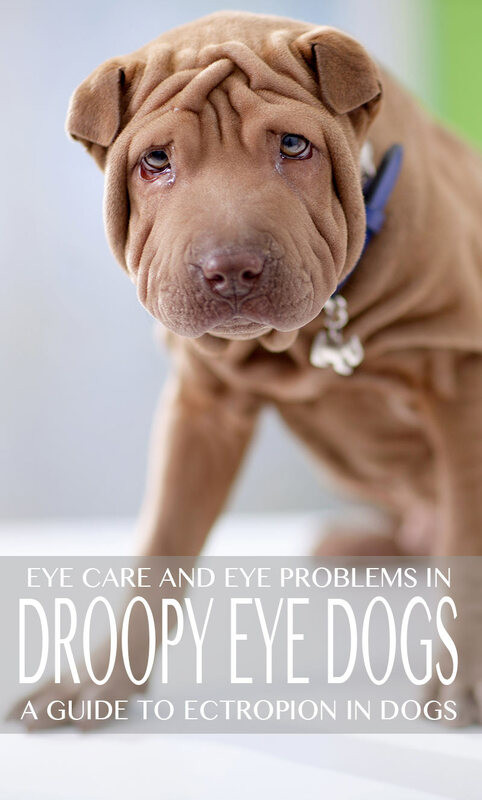 And as it is quite easy to diagnose, there is actually no need to breed from a droopy eye dog. Plainly put, there is no need for ectropion to be anything other than the most rare occurence. All that is required to put an end to most incidences of ectropion, is for breeders to only breed from dogs that don’t have droopy eyes. 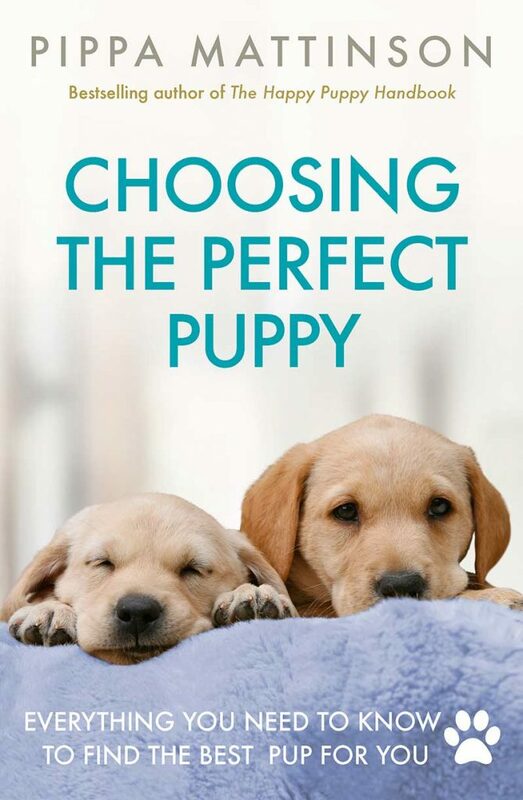 Perhaps the very best way to cure ectropion for good is to persuade puppy buyers to buy puppies from parents with tight eyes. Once the demand for puppies dries up, breeders will stop producing them. 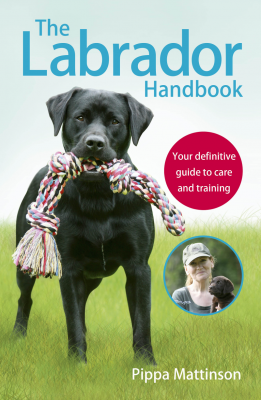 Look out for excessively loose skin when you are choosing your next puppy, as this is often associated with ectropion due to lack of proper support for the lower eyelid, and the simple dragging effect of the weight of the skinfolds below the eye. Is there a cure for ectropion? Strictly speaking ectropion is not usually cured. If the degree of ectropion is mild, then it is usually managed, rather than corrected. This means being careful with your droopy eyed dog, keeping him out of undergrowth and away from dust and dirt where possible. And acting promptly with a vet visit, each time infection sets in. There are a variety of treatments available for ectropion, and what your vet prescribes will depend upon how serious your dog’s case is. In minor cases topical lubricant can assist them, in conjunction with good eye and facial hygeine. In the short term bacterial infections will be treated with antibiotics, usually in ointment form. Surgical procedures that can shorten the eyelid, or even give the dog a full facelift. Dogs with droopy eyes can be very appealing. But remember, that the more the eyes droop, the greater the risk of repeated infections. And if you have ever had conjunctivitis yourself, you’ll know just how miserable this can be. 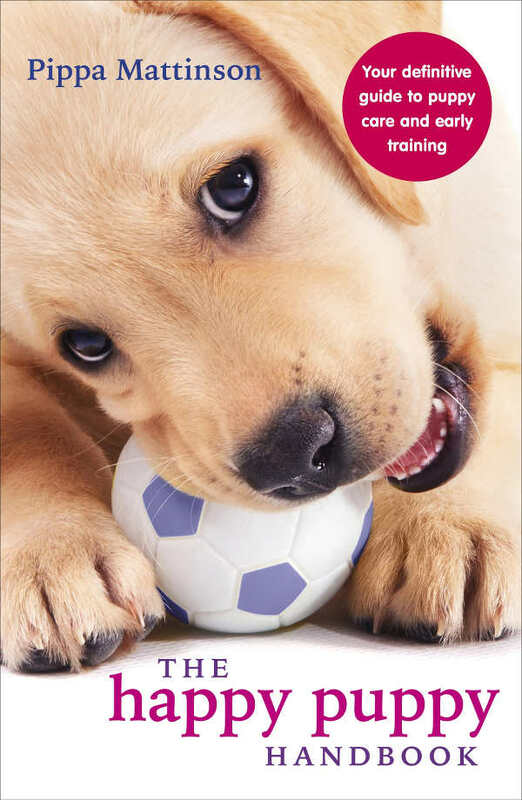 If you are looking to buy a puppy from a breed prone to ectropion, and that includes many of our sporting and giant dogs, find out from the breeder whether their parents have a history of eye problems. Make sure that neither of them has had to have surgery to correct the issue, as their poor genetics would still be passed on to the pup. Make sure you see both parents when buying your puppy, and assess for yourself whether you think that the skin is excessively loose. Remember, the problems caused by ectropion are very painful and you don’t want to have your lovely puppy experience marred by having to deal with this horrible condition. Great article but please add that these dogs especially Great Danes end up in the pound. Please encourage to rescue, have the surgery which I will be doing. She will be my service dog.. in training now. A lot of love to offer… rescue not thrown to the side just because of backyard breeders cant sell! !